How To Bowl In The Zone With Sport Psychology And Self-Hypnosis. 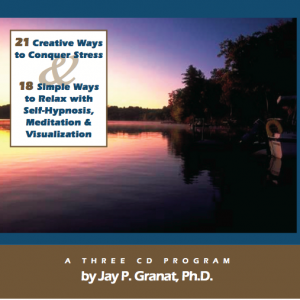 Two CD Program and Free Book. How To Bowl In The Zone With Sport Psychology And Self-Hypnosis. 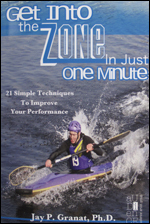 PLUS Free Book – Get Into The Zone In Just One Minute: 21 Ways To Improve Your Performance. Do you choke under tournament pressure? Are you losing to bowlers you should beat? Are open frames and splits killing your score? Would you like to add two or three marks to your game? Want your average to jump by 39 pins? What should your mind and your body do when you get ready to bowl? Are you sick of blowing matches in the ninth or tenth frame? Would you like to be calm, focused and confident when you step on the lanes? You have taken bowling lessons, but you are still not bowling to your potential. You love the game, but you are really frustrated. You are angry with yourself for not bowling the way you know you can. You are not performing to your potential. You can’t seem to relax when and focus when you are on the lanes. Well now there is a simple program to help you bowl like a champ when the pressure is on and add pins and marks to your game. 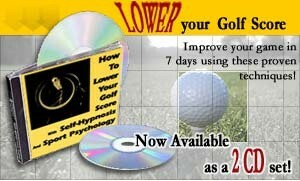 A Program Designed For Bowlers of all ages. 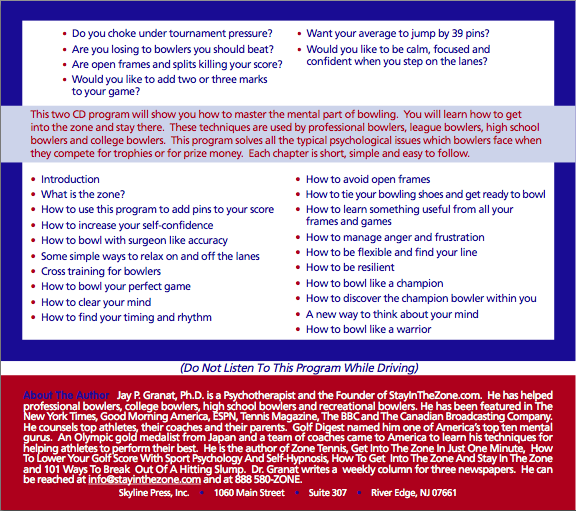 This two CD program will show you how to master the mental part of bowling. You will learn how to get into the zone and stay there. These techniques are used by professional bowlers, league bowlers, high school bowlers and college bowlers. This program solves all the typical psychological issues which bowlers face when they compete for trophies or for prize money. Each chapter is short, simple and easy to follow. Most chapters are less than six minutes long. Who Developed This Program for Bowlers? You can reach out to Dr. Granat with any questions anytime. 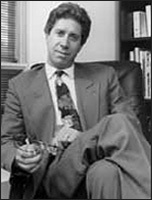 Call him at 888 580 ZONE or email him at info@stayinthezone.com So, when you get this program or any of his programs, you also get another coach or consultant who wants to help you and your child. When You Buy the Bowling CDs, You Get Your Own Mental Toughness and Peak Performance Bowling Coach. 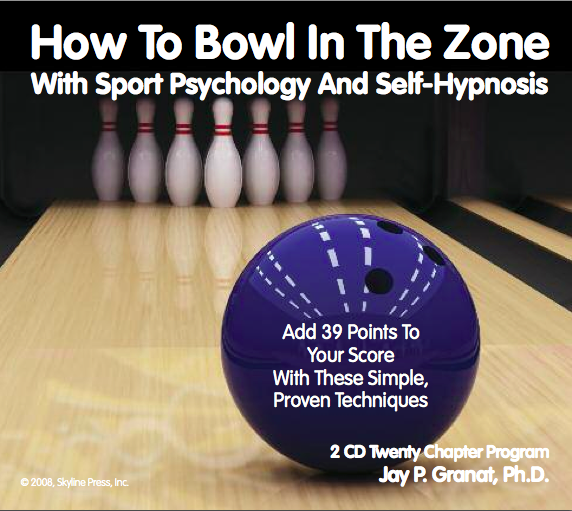 The Bowl In The Zone Program Comes with a Free Book! Get Into The Zone In Just One Minute: 21 Ways To Improve Your Performance. 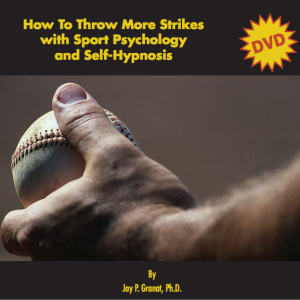 This book will show you exactly what you need to do to get mentally ready to bowl before you step on the lane and put your fingers in your ball. It’s a twenty dollar value and its yours free with when you get the Bowl In The Zone Two CD Twenty Chapter Program. 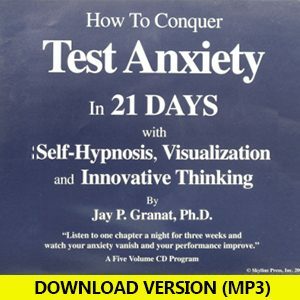 Use this program for thirty days. If you are not satisfied with the results, return it for a full refund.